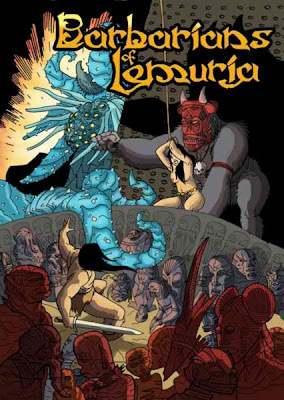 I had the chance to pick up Barbarians of Lemuria: Legendary Edition recently and I have to admit I was quite pleased. The game was not at all what I expected it to be. Well...the setting and the tone was, the mechanics were not. This is the best combination really. Ok, so tone. Barbarians of Lemuria is what I expected in that it is a fantasy game of mighty barbarians, evil warlocks, sly thieves and semi-naked women. Very much the stereotype of the Pulp Age of fantasy I expected it to be. Except it plays it with an honesty and earnestness that I really want to play a big, dumb barbarian with might thews and a giant axe. The game is full of sorts of great background that I could adapt it to any old-school fantasy game with no issues and run with it. I mean honestly look at the cover. Barbarian standing in a pit surrounded by vaguely eldritch horrors as a tribal shaman gorilla prepares to sacrifice a slave girl. If you think the next scene is the girl's spilled blood and horrors unleashed over the land, then go play a horror game. If you think the next scene is that sword cleaving through the bodies of the horrors and the barbarian killing the shaman and saving the girl. Then this is the game you want. The system I have to admit took me aback, in a good way. I was expecting another OGL-based or D&D-clone, but instead we get a very nice, very simple system. Character creation is all point-buy, and not dozens of points, but 4. The real joy here is being able to create a character is minutes and get going. The underlying mechanic is a simple 2d6+mods vs target number of 9. This makes it very, very similar to Unisystem and also to Spellcraft & Swordplay. I suppose that if you wanted a more flat game then you could use a d12. But d6s are great and they give us boons and flaws. Boons and Flaws are a neat mechanic. In either case you roll 3d6 instead of 2d6. If you have a boon, drop the lowest d6. If you have a flaw, drop the highest. Each character gets a boon or two boons and a flaw. There is plenty for everyone to do in combat since fighting style can vary. I like that the emphasis here is that everyone has a chance to be the hero. Sure you might be a lowly thief or slave, but you still have something to contribute. The careers are nice touch and helps give your character some background on what they were or did, or what they can do now. Frankly I enjoy how it is all put together. The art is good, not up to the level one expects from say Pathfinder, but perfect for the tone and the feel of this game. And I liked it, so that is great for me. The magic system is very open and reminds me a lot of magic from the time period. These are sorcerers that gained their power through evil pacts or forbidden knowledge. There are no Hogwarts grads here. It really is a lot of fun and the rules-lightness of it is a huge benefit. Even if I didn't like the rules I could use this for my own fantasy games since the background information is so great. Of course I should stat up a character and who better than Red Sonja. This sounds like the S&S game I have always wanted. Even though I cut my teeth on D&D and still enjoy it I've found that I prefer rules lite and point buy systems. Looking at the stats got me curious, what are Hero Points in this game? BoL has been my favorite game for quite a while now. I like both its lightness and the flexibility of the rule set. It's been molded into a post apocalypse setting, a men's adventure setting, and a pulp setting as well as other worlds such as Hyboria. I like the character write-up. Thanks. Damn You WotC for giving me what I want! Ohmigod! It's Totally 80s Friday!